Directed by Ratna Sinha and Produced by Manju Bachchan and Vinod Bachchan, Shadi Mein Zaroor Aana is Drama and romantic Bollywood movie released on 10th November 2017. Rajkummar Rao and Kriti Kharbanda took up the lead roles, whereas K.K. Raina, Alka Amin, Vipin Sharma, Manoj Pahwa, Govind Namdev, Navin Parihar, Nayani Dixit, Karanvir Sharma, and Abhijeet Singh have performed in the supporting roles. Screenplay and Music are done by Kamal Pandey and Anand Raj Anand respectively. This 2017 Box Office super hit is well received by both audience and critics equally. Below in this article, you can find the details about Shaadi Mein Zaroor Aana Full Movie Download and where to Watch Shaadi Mein Zaroor Aana Online. Shadi Mein Zaroor Aana is a complicated love story about Aarti Shukla and Satyendra Mishra. Aarti is an intelligent girl, whereas Satyendra is working as a clerk in the Excise Department. Let us see Shadi Mein Zaroor Aana in detail. Aarti and Sathaendra start meeting regularly so that they know each other well. The more they meet, the more they start falling for each other. During the day of her marriage, Aarti PCS exam result comes positive and she decides to pursue it further. But her uncle misguides her that she would be allowed to do this after marriage. Hence, she plans an escape without letting Satyendra and his parents know about it. This, in fact, gets Satyendra family into a lot of trouble. On the one hand, they have to manage their boy and on the other hand, Aarti’s parents are asking for the money that gave as dowry. 5 years later, Aarti has involved in a big scam blamed for taking a bribe. In fact, she gets suspended until decared innocent. Later, she gets to know that the one who will be investigating her case is no one but Sathaendra who is now an IPS officer. Whereas, Aarti is quite shocked to see Sathaendra’s rude behavior and blames that he is doing it for revenge. During the day of the result, Aarti is declared innocent and she gets to know that Sathaendra was the one protecting her. When Aarti gets to know about Sathaendra true side, she keeps on convincing her for getting married. But the heartbroken boy refuses. One day, Sathaendra gets a wedding card, where he sees that Aarti is getting married to Sharad. After seeing this, Sathaendra gets mad and gets in the wedding furiously. Later, they get to know that this was just a plan to let Sathaendra know about how much he loves Aarti. Finally, they get married and living a happy married life. 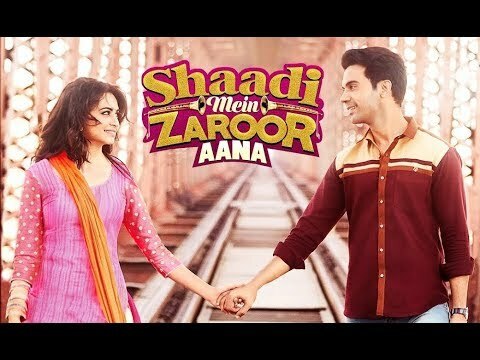 Where To Watch Shaadi Mein Zaroor Aana Full Movie Online? You can watch Shaadi Mein Zaroor Aana online only on ZEE5. Usually, it takes 3-4 months to get available on all Major Legal websites from its release date. You can check back to us, once the movie gets available on below-mentioned websites we will update it. Disclaimer: movie-rater.com supports legal mediums for movie download and is against any types of Piracy. We also request our readers not to engage in downloading or watching Shaadi Mein Zaroor Aana Movie from any illegal websites. Also, watching or downloading Shaadi Mein Zaroor Ana from any illegal websites is against the Indian Copyright law. By doing this you will also save thousands of families who are working in these industries. Below is the list of websites of Illegal Website for which the production house of Shaadi Mein Zaaror Aana not authorized.